Compatible with all antifreezes including orange Dex-Cool™. Lasts for 5 years, 300,000 miles or 6,000 hours. Reduces formation of abrasive solids to help extend water pump life. Caution: Do not remove radiator cap if engine is hot. 1. Check cooling system for leaks, loose connections or worn parts. 2. After making sure engine is cool, remove radiator cap, open radiator and engine block drains, and then flush system completely with clean water. 3. Close radiator and engine block drains when all water is drained out of system. 4. Fill radiator with desired ratio of antifreeze, making sure that the level is slightly lower than the filler neck. 5. Set heater on high and run the engine to normal temperature; the thermostat should now open, releasing any trapped air. If necessary, add more solution to fill radiator. 6. Finally, replace radiator cap and check for any leaks. 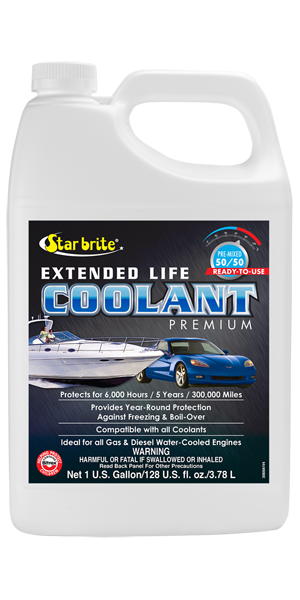 Star brite Extended Life Premium Coolant is a 50/50 ready-to-use mix. For best results do not dilute! Lasts for 5 years or 150,000 miles.